The best water features in Central Iowa! A water feature or waterscape can help turn your yard or living space into something special. Its a great way to enjoy the sound of running water and create a little escape from the hustle and bustle of city living. A water feature with water running through beautiful stones or bubbling up through a decorative urn can have a calming and soothing effect and help you unwind from a busy day at work. Not only do water features add beauty to your property but they also add value. Adding a water feature or waterscape to your patio or property will greatly increase its desirability. Fountains - these can be big or small water features, depending on the effect you desire. Do you want a water feature with bubbling water or more of a geyser effect? Koi ponds - these are a great way to bring nature closer to you. Your pond can be a decorative waterscape or you can stock it with fish such as koi. Adding a diverse mix of water plants will add to the natural beauty of this type of waterscape. Natural swim pools - these are a fantastic and eco-friendly waterscape that brings nature and your recreation together. Plants and natural biological filters take the place of chemicals to keep the water clean. Artificial streams - an artificial stream makes for an attractive waterscape and is a wonderful addition to anyone's property. The gentle gurgling of water has a calming effect and will make your artificial stream your new favorite place to unwind. Waterfalls - when people picture a relaxing tropical oasis, there is always a waterfall in the picture. Big or small, these water features add pop to your landscape. Water Features and waterscapes require periodic maintenance because of algae growth, mineral scaling, debris, and rust. Pumps also need to be cleaned and serviced periodically so you need an expert when it comes to servicing and maintenance. Beemer Landscaping can take your existing water feature or waterscape and service it, clean it, or even rebuild it. We are the Central Iowa waterscape experts! 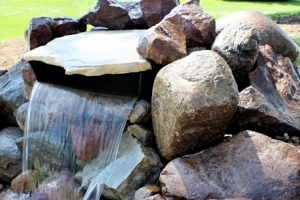 Whether it is a pond, fountain, birdbath, waterfall, or an artificial stream, Beemer Landscaping can help you decide on a water feature or waterscape to customize your living space and create the relaxing atmosphere you've always dreamed of. We service the entire Central Iowa area so contact us for a free quote or fill out our Landscaping Project Questionnaire.